I have said it numerous times in my reviews: Dark Horse Comics’ Black Hammer is one of my favorite books in recent memory. The exploration of the superhero archetypes we know and love become grounded and humanized, with fantastic results. With Doctor Star, we get another spin-off that introduces a new set of characters and another side to the superhero story. By Jeff Lemire with art by Max Fiumara, colors by Dave Stewart, and lettering by Nate Piekos of Blambot, this is one tremendous debut issue. 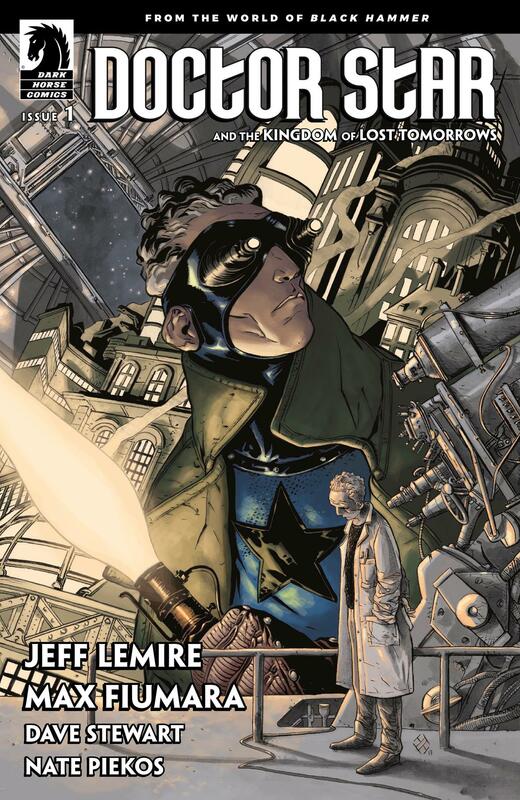 Doctor Star is, of course, influenced by the popular DC Comics hero Starman, and even nods to the character as our lead protagonist, Jim Robinson, shares the last name with the man that made Starman a hit, James Robinson. The story starts in the present and bounces back to the distant past, to when a simple man working at an observatory becomes something aligned to the stars. But at what cost? Lemire is my favorite writer going right now, as his books are all so different, and yet all pack a wallop. His build-up on the backstory of Robinson, the emergence of Doctor Star, and how he ties into the rest of the heroes in the Black Hammer universe, is uncanny. Fiumara’s artwork is a great fit for this sometimes retro, sometimes moody and depressing story. Stewart’s colors are always on point, and this issue is no different. With Doctor Star, we get a new, tragic hero, and an ending that will gut punch you before you finish the last page. I have loved everything connected to the Black Hammer universe, and Doctor Star has me now waiting to see what exactly happens to Robinson and when he hung up the goggles and stopped looking at the stars.